On a more serious note, the objective of this article is not only to choose a health plan by paying lesser premium, but also to choose the best possible cover with maximum features at an optimum cost. Here are some ways you can do so. Opt for a family floater option instead of individual policies for family members. By doing so, you can safely opt for a lesser total sum assured compared to individual policies (since the possibility of all members making a claim in the same policy year is remote) thus reducing your premium amount. If you are going in for a high cover, instead of taking the standard health cover for the required sum assured, take a part of it as a separate critical illness cover; since a critical illness cover costs much lesser. Also, logically one is likely to exhaust such a high insurance cover only if he or she contracts some major illness! To put in simply, a 10 lakhs standard health cover would be more expensive than a 5 lakhs standard + 5 lakhs critical illness cover. If the individual is young and has a good health profile and is unwilling or he or she cannot afford to pay a higher premium, a cover with sub-limits for specific illnesses and limits on coverage will work out much cheaper. This is not a recommended option, but if you are unable to afford the regular premium, some health insurers offer policies with the co-sharing option at a much lower cost. 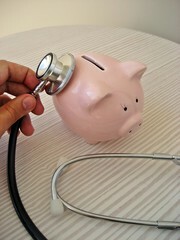 Here, in the event of a claim, the insurer and the insured share the medical expenses in the pre-specified proportion. There are many health insurance providers who offer freebies like a free health check up after a specified number of years. The insured should be aware of such features and make use of them to maximize the benefits on his/her health insurance policy.